The add-in supports a bi-directional data exchange between Fusion 360 and Dynamo Studio, allowing users to create visual logic for Fusion 360 parameters update. 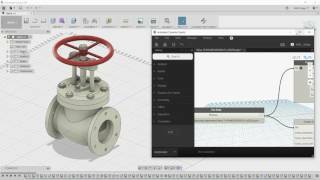 It provides an ability to use a visual editor environment to modify Fusion 360 model parameters, view and use them in complex logical graphs. Fusion 360 parameters will be automatically updated from Dynamo Studio using custom input and output nodes. Supported Dynamo Studio 2017 version: 1.1 - 1.3. With the last version it works very well! i have downloaded the last version of dynamo, is the version 1.3.0.881 and at the setup it say´s please download dynamo,it is required.